Making space of a usual shoe box? Easily! Add a little imagination and gouaches, and here you are ready to go distant stars in a space ship. 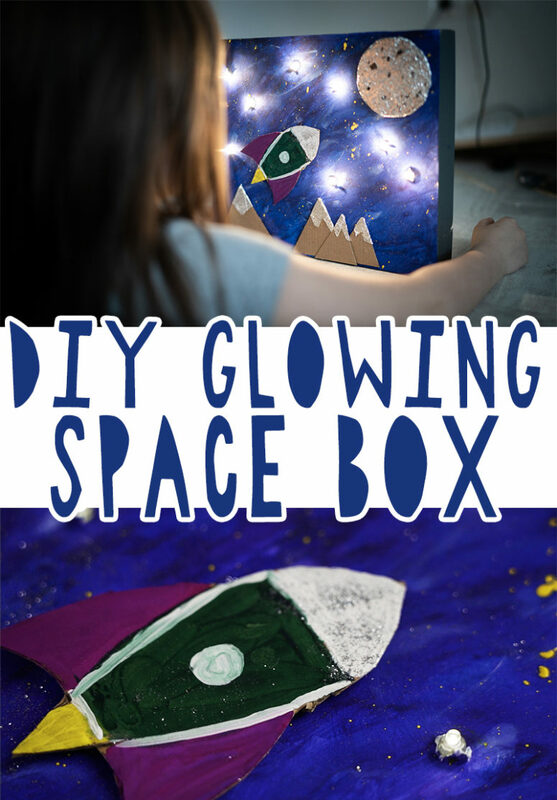 This children’s cardboard craft can be realized very easily and quickly, and lights instead of stars make it very unusual and even a little magical. 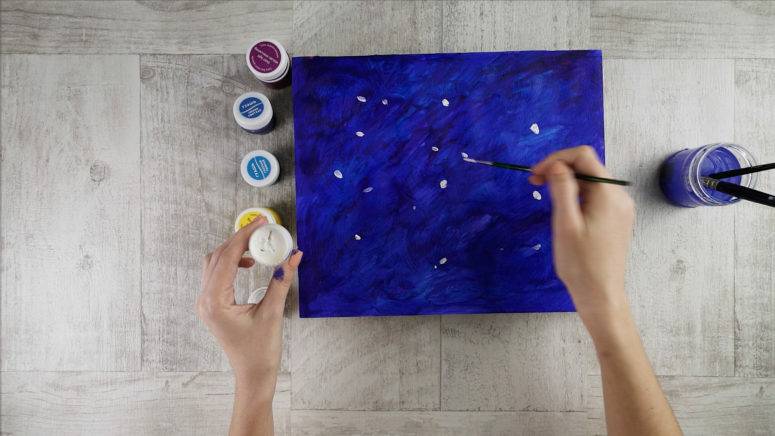 It’s not only interesting to make, but also to turn on and off the stars is very exciting. This space craft is also great for International Space Day (April, 12). 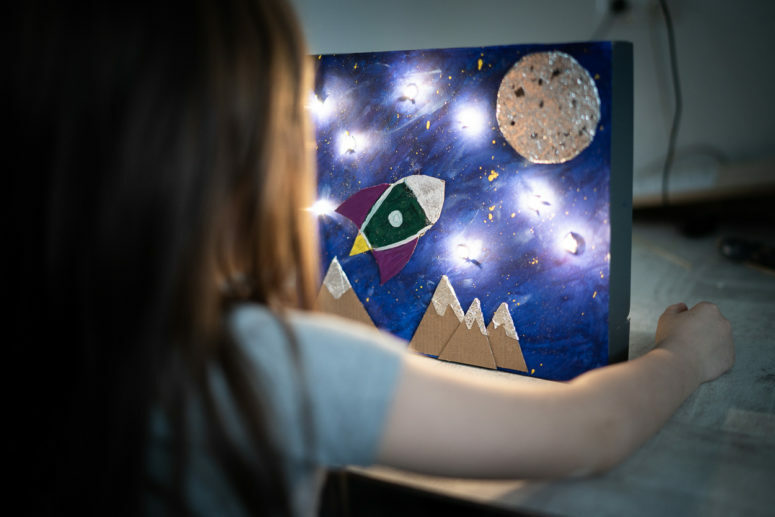 But even this holiday has already passed, then this “space out of the box” can be used as a nightlight for a child’s room and, falling asleep, you can dream of distant stars together. The supplies are colorful gouaches, a glue stick, some foil, a piece of sponge, paintbrushes, a pencil, silver glitter, scissors and LED lights. 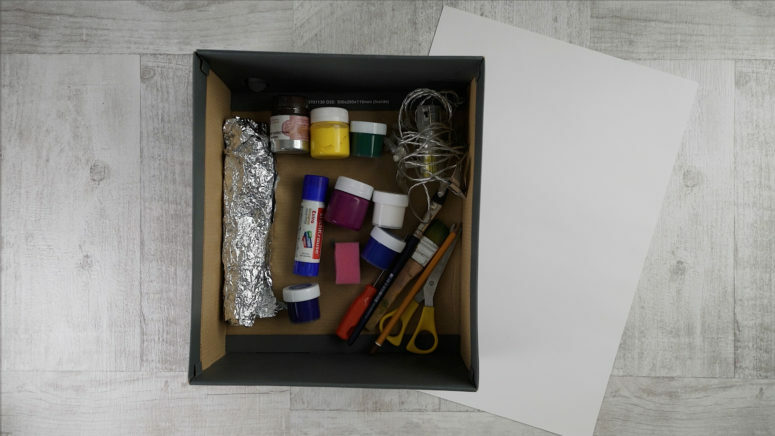 Take the lid of your shoe box and trace it on a sheet of paper with a pencil. 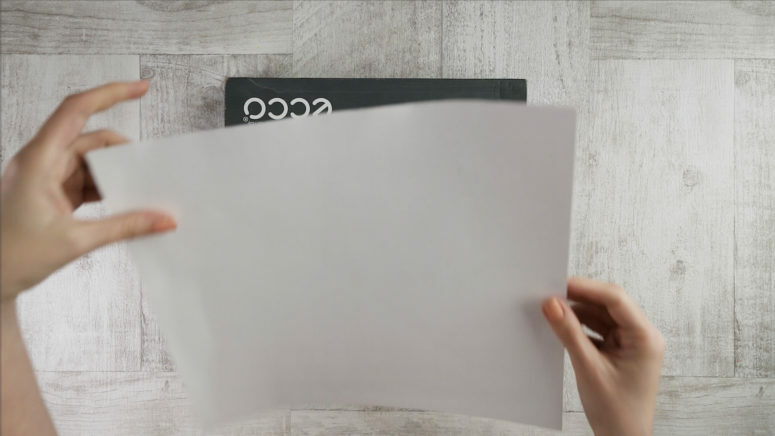 Cut out this piece of paper and glue it to the lid. 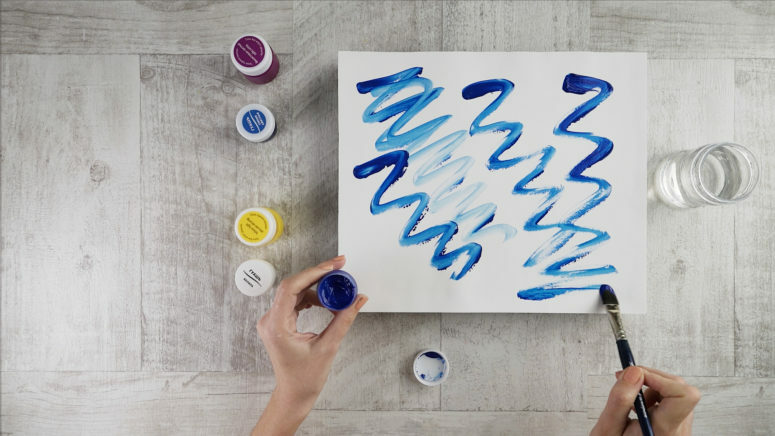 Take blue paint and paint some waves on the paper. Do the same with purple paint. 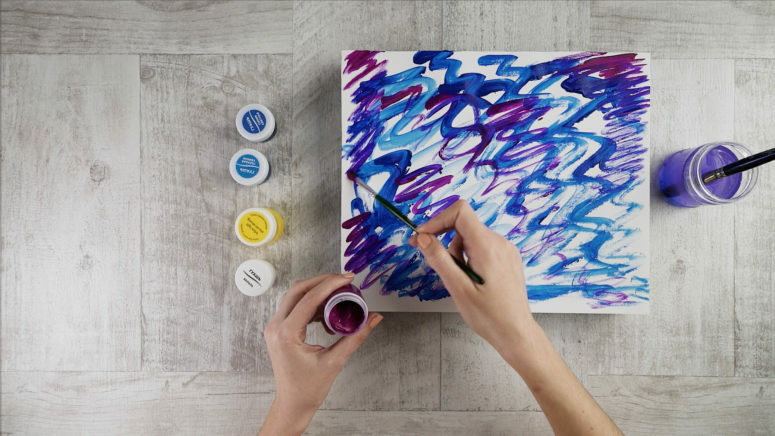 Cover the whole sheet of paper with these blue and purple swirls and waves. 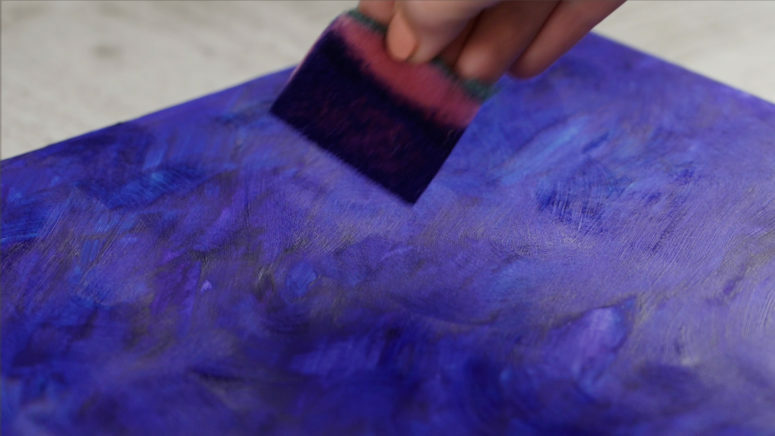 Take the sponge and apply it to the paper to create a texture. Take white paint and make some white dots on the paper, sponge them too. 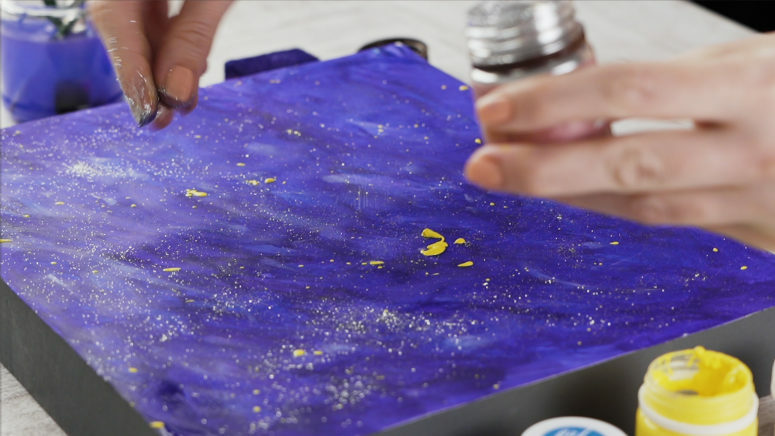 Make some yellow splashes on the paper using two brushes and yellow paint. Add silver glitter on top – as much as you want. Take a piece of the box and trace a glass. Cut the circle out. 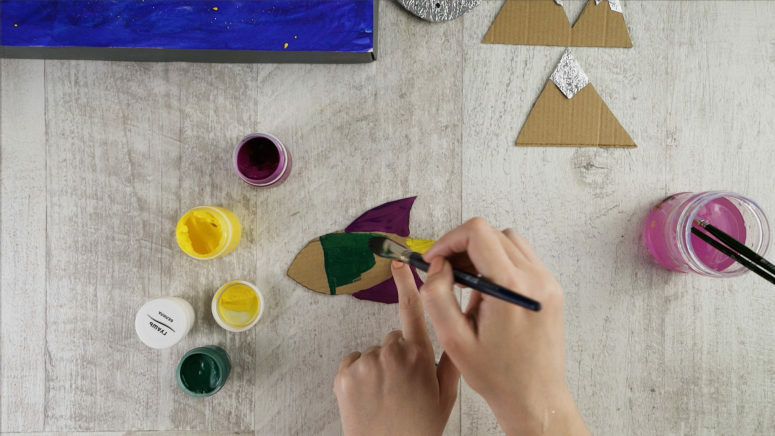 Cover it with glue and attach your piece of foil covering the circle completely. Attach two cardboard squares on the uncovered side. 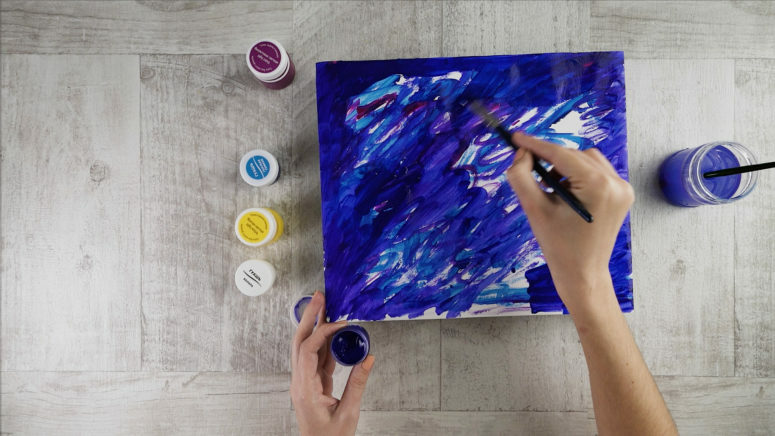 Take black paint and make some black dots on the foil using a paintbrush. Cover them with glue and add glitter. 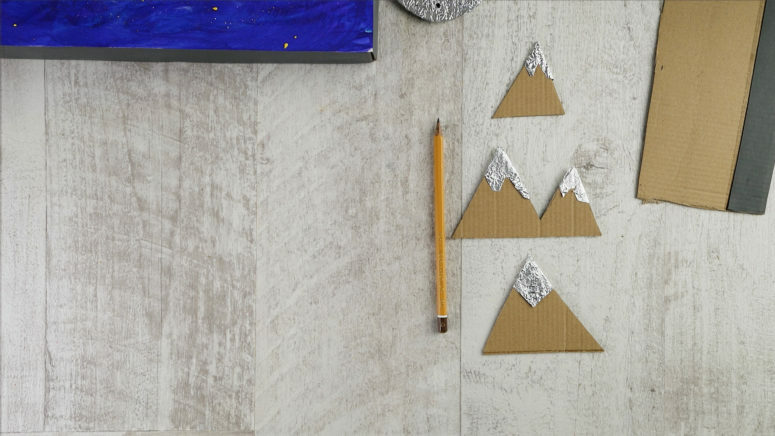 Draw some triangles on the cardboard using a pencil and cut them out. Glut eh top of one of them and attach some foil. 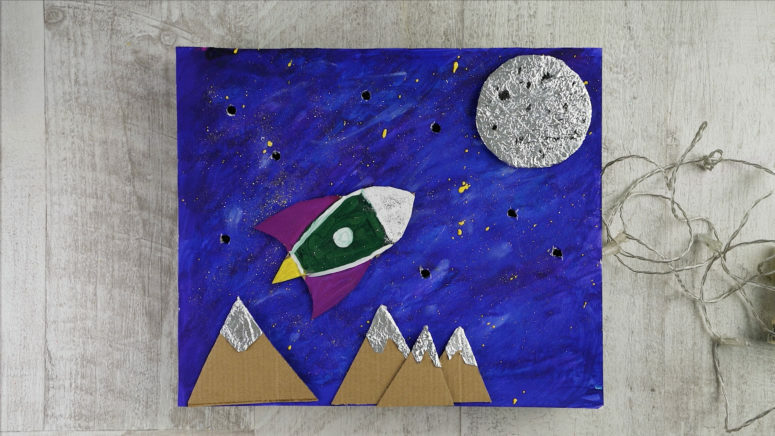 Draw a little rocket on cardboard and then cut it out – your may use the idea from the tutorial or choose your own shape. 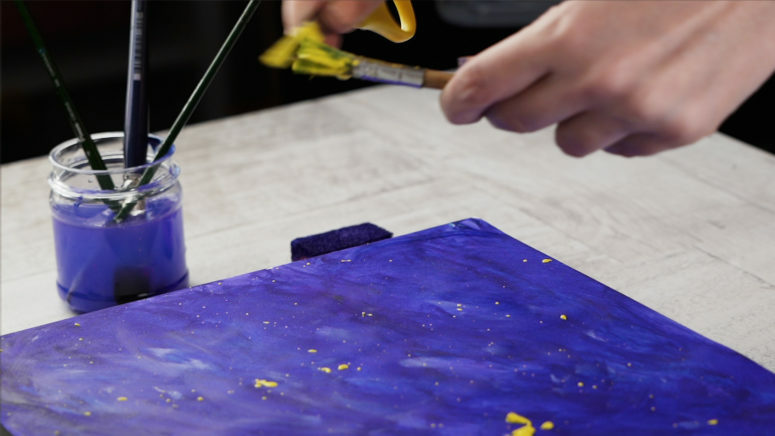 Paint it in bold colors, here – purple, yellow, white and green, and add some glitter. Glue some cardboard pieces to the rocket. 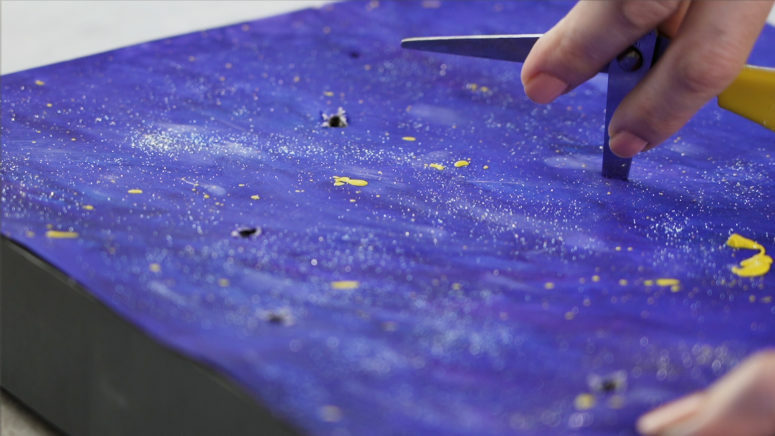 Make some holes in the space piece with an awl, then enlarge them with scissors. 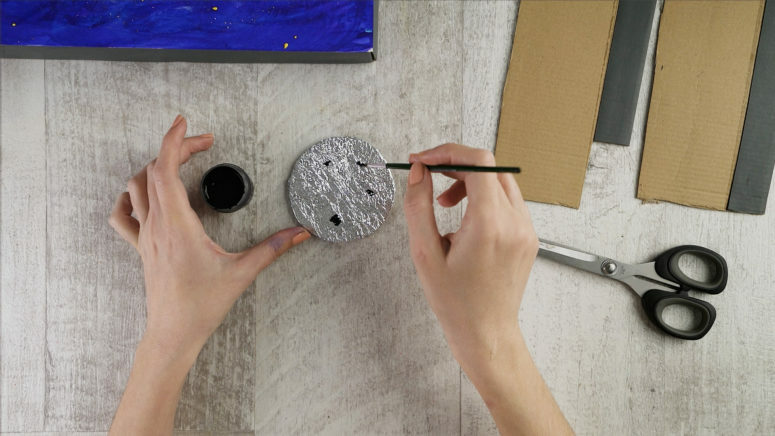 Glue your silver moon or planet in one corner of the artwork. Add some foil covered mountains in the bottom and a rocket above them going to reach the planet. Insert your lights into the holes and turn them on!